The McMorran Lab is interested in developing and applying new methods in electron microscopy, holography, and nanofabrication to gain fundamental insights into the properties and quantum behavior of matter. 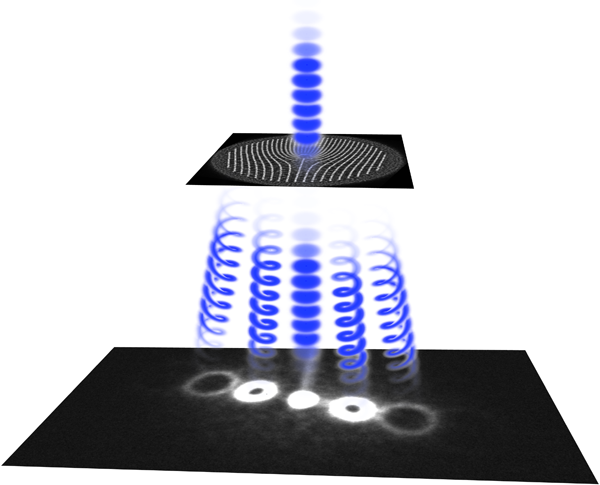 Our lab has pioneered the use of nanofabricated holograms to diffract and coherently sculpt electron matter waves with picoscale feature sizes. We apply this technique inside conventional electron microscopes to prepare electrons in desired quantum states. One highlight of this research is the demonstration of electron vortex beams, com posed of freely propagating electrons in quantized orbital states. In addition to performing fundamental investigations of how these unusual free electron states evolve in free space and interact with electromagnetic fields and matter, the group has a particular interest in applying these beams to study magnetic materials and biomaterials. The REU project will involve nanofabrication (focused ion beam (FIB) milling, e-beam lithography, and thin film deposition), matter wave optics experiments using electron microscopes, and/or software programming, theoretical studies, and computer simulations, all depending upon the student’s interests. The student will work alongside graduate and undergraduate students to learn about electron microscopy and imaging systems, interferometry and holography, and the quantum behavior of matter.